Buying gifts for beaders is something like buying new gadgets for technophiles: who knows what they need or want? Beaders can be stringers, wrappers, weavers, loomers, or just sorters. And within those specialties lie a world of threads, needles, tools, pins, rings, and wires. It’s a mysterious world for friends of beaders. 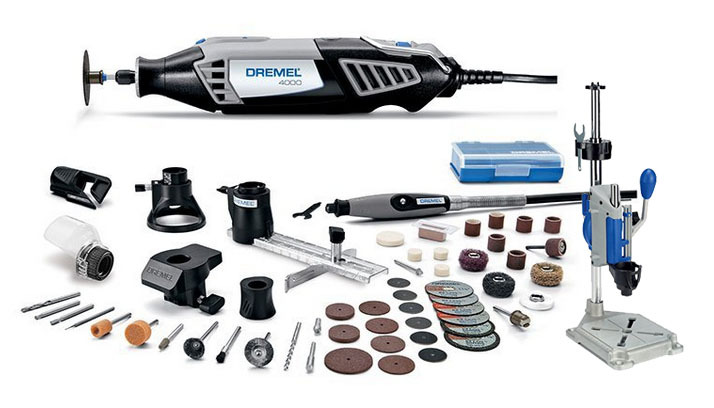 Maybe next year: The Dremel 4000-6/50 120-Volt Variable-Speed Rotary Kit and 220-01 Rotary Tool Work Station! Fortunately there is such a thing as online wishlists, which allow us to send specific wishes, as I did to the men in my life this Christmas. Amazon’s Wish Lists, for example, can be read by your friends and relatives everywhere, and gifts can be shipped instantly. I love their selection of beading books. Sure, it’s now super easy to get instructions online, including videos, but I love a big book in living color. Sometimes I have to stare, squint, and frown at the diagrams for a very long time, and read the instructions aloud over and over. And of course a book, unlike a computer screen, can absorb blood from pricked fingers and sweat from hot lights. There are also random tools, organizers, and supplies. I flipped for the Beadalon Bead Station that holds spools and tools atop a beading table, and knew I would need it desperately if I ever had a beading table. Amazon sells beads as well, but beads I like to paw through at the bead store; in my mind they need to be touched, measured, held up to the light, and inspected.